My first pragmatic instinct nags me that baking bread or freshly grinding spices or knitting are rather indulgence celebrating a romanticized past. I later realize that those who bake bread can eat it warm, or those who knit can choose eccentric designs, or those who grind pepper can get wholesome flavor off the fresh pepper oils. One of those archaic relics of not so distant past is grinding up flour for bread – which is something I have never seen anyone do now. Prior to the mass proliferation of cheap electric grinder in early 1980s, every household in the Indian subcontinent used these stone grinders. Chakki, the traditional millstones or mill stones from Indian subcontinent, grind wheat into Atta flour or split legumes in half for making Dal or ground up fresh roasted spices. 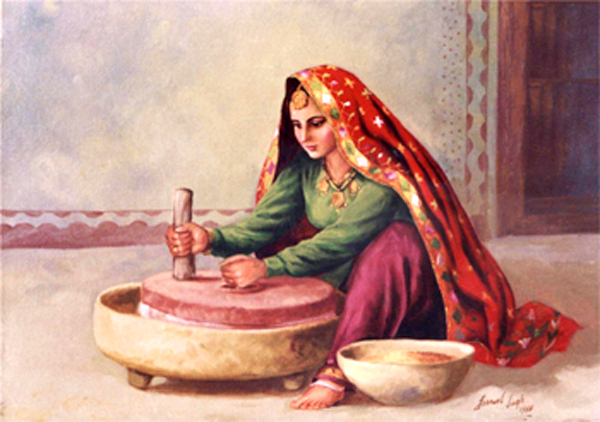 For most people who know about Chakki, it evokes either idyllic image of female members of grinding up floor for roti, such as shown in the painting. For others, Chakki reminds them of backbreaking work often comically referred to as default job inside jail in Bollywood movies. Chakki consists of two stone cylinders. An upper stone cylinder rotates on top of another stationary stone cylinder, which is generally larger than the lower cylinder. Grains are fed in between the two cylinders from a hole in the middle of the top cylinder. When the cylinder rotates, the grains squeezed between the cylinders are grounded, split or separated from husk. Generally, in the home version of a Chakki is the top stone rotated by placing a wooden club as the handle inside a smaller hole on a side. The home version is operated by one or two people. The larger Chakki uses livestock to rotate the upper cylinder. Chakkis are made from stones but one can find other variants made from wood, which are believed to better at separating husk from the grain. Finding someone using Chakki in a city is rarity nowadays. I was lucky to find a local grocery vendor using it split daal. 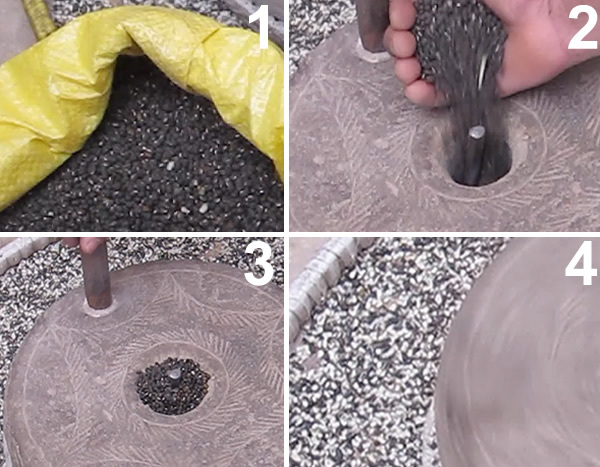 In the video, the local vendor puts whole urad beans on a hole on the top cylinder and as cylinder is rotated the urad beans is split into half in between the two cylinders to give urad daal. See my earlier post on urad (kalo) daal and jimbu. The posted video shows Chakki splitting whole urad bean was shot in Kathmandu, Nepal. Newars in Kathmandu call this millstone Gha, while rest of Nepal calls it Janto and more recently by its Pan-Indian name Chakki. I am not sure if grinding flour and splitting bean by Chakki make them taste better. However, I am sure that freshly grounded flour and split beans do taste different. Ask any coffee connoisseur if freshly ground beans are necessary for their morning espresso. 12 comments for this post. Very interesting post! Would love to try some freshly ground flour Naan!! @Mdivani We would love to hear about your freshly ground naan. Oh this brings back memories – my mum still uses her chakki albeit now connected to an electric motor to make her own atta and when she visits and brings me a bag, it is bliss! Now if only I had the heart to pay a gazillion dollars in shipping a granite chakki to DC I too could delight in such home ground chakki naan and rotis! @Devaki, I would love to see the photo of chakki – connected to an electric motor. I have heard of this but never seen it. Perfect example of keeping cherished old tradition alive in 21st century. How interesting this post is. The chakki has been shown the door much like the ‘sil batta’, but the taste is stone ground in unbeatable! My mom still uses the ‘sil batta’ for her curry masalas and the taste speaks for itself. Thank you Deeba. Indeed freshly grounded sil batta curry masala are amazing! The copyright to the photo belongs to the artist and was used here with the permission. Please contact the artist directly. Can this be used to de husk rice and millets or will it split them or grind them into flour? Can you show a video of dehusking not splitting? I’m confused. I thought this Chaki grinds seed into flour? But here you show it splitting the dal. But can it also dehusk seed and how? Like does it grind, split and dehusk and how does it do these three separate tasks like do they change the wheel or turn it differently ? Can you show us the wood one? You say it is more effective in removing husk. But what kind of wood was it made from and why wood is better? Chakki is available in Manglore in India and the price is Rs.7000.I was searching for me and a friend told me.